Day 2 - Again Monday? 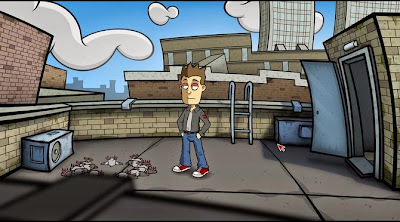 While you play Randal's Monday, the tips that you have provided by the developers will help you. Just open your inventory and right click on the magnifying glass. Then answered several times the question with "Yes" and you will receive for each chapter tips on what you should do next. For every tip you need, however, "Kill a Kitten," which makes the decision, of course, much more difficult. On the following we will teach you what you need to do in order to survive Randal's Monday. We wake up after a night in Randall's bedroom and find that we don’t only have a nasty hangover, but also an urgent need to work. But first, let's take a look at our inventory, in which is still the wallet from Matt. After we have once scrutinized itself, there is some money and the ring was meant as an engagement ring. After we have taken the chaotic space a little more closely, we go into the adjoining living room. This looks regulatory technically not much better, but includes some items that we can make good use later. First, we notice the newspaper lying on the floor in front of the entrance door. A broom leaning against the bookshelf and, of course, once part of our inventory. On the sofa still is the remote control, which also pulls us under the nail. Even in the bathroom expect something that of course we cannot leave a duck-strap that on the wall. After that, we now embark on the way to work - but when we want to enter the corridor, there is Mr. Marconi, our landlord, who finally wants to collect the rent from us. As we have seen so far Randall, we can imagine that he currently has, of course, no money, he can give his landlord. After a short, little insightful conversation with our roommate turns out to be strange hermit, we know that he has no money - or at least we close his grunt. The money issue will have to wait, because we are now coming too late to work. But how do we get there, if the landlord in his underwear in the corridor just waiting to get access to our wallet? Quite clear about the fire stairs to our bedroom. So we climb down the path and watched in the next floor not only from the prying neighbor Mrs. Large, but also by a rather scary cat also barred our way, are observed. So before we can continue, the cat must disappear first. Unfortunately, cajole does nothing, so we have to use brute force. We combine our inventory broom with the duck Ironing and get it into a telescope Duck bracket and a wire. With our new tool, the telescope Duck rod, we can now release the hook above the head and then continue on our way down. Finally arrived in the alley we meet there on a "bum" who is firmly convinced that we are cursed. But before we can sprinkle about his wisdom and vision of the future, we'll grab the glue tube, which is located in the bin behind us. Then we start a little chat with the old man and get his business card (Rusty razor blade). Once we have established this promising business contact, we leave the alley and head to the subway entrance. There we quickly realize that the ticket machine is unfortunately broken. So we talk to Betty, who stands at the ticket counter - but this is totally absorbed in his mystery and does not really seem to understand our problem. So let's take a look at our inventory and combine the rusty razor blade with the first glue tube, so as to remove the lid of the tube. Then take the phone from the phone to the right of the ticket switch on the floor (hand + receiver) and joint Betty thus for a brief moment. During this time we are looking for in the inventory by the open tube of glue and sprinkle some on the phone. Now we use the intercom left of the switch to lure Betty to the phone. After she has virtually turned, we can overcome the turnstile without a ticket with a jump. Unfortunately not miss the watchful eye of Officer Murray, who then quoted us straight to his office. Unfortunately, we cannot get until he has completed his report. So we steal one of the small figures stuck on the big globe and then use the oily pages in our inventory with the small pin down the globe. We can, however, only make if the room does not wobble. Finally, we take the bolt and observe the following escape sequence. We finally buy a ticket at Betty and take the subway to Emerson Express. Arriving at Emerson Express, we first take a traffic cone, standing in the middle of the road. Then we finally move into the work be fired only to find after an argument with the boss. As a parting gift, we still get a broken radio that will put us in the truest sense of the word to the head. We collect the same, take a look in your inventory and get both a mother and a spring. Then move into the pawn shop on the opposite side of the road, where we try to sell our stuff in your inventory to cash. Of course, the owner is interested in any of our treasures, as we take the subway back home to look there for something useful. Although we have now arrived back at home, where our apartment but we can not, because the landlord Marconi still waiting impatiently for his money - which we don’t have. So we talked to the poor representative sitting in a heap further to the right on a stairway. Now that we have briefly talked with him, we convince him that he should talk to but once Marconi to sell him his goods. Unfortunately, the representative is also not very successful. In an interview with Marconi then we choose the last option dialog and ask him if he still at the door waiting to be paid. 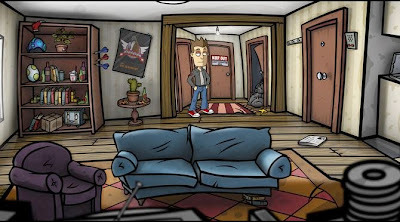 Now we finally have free course and can back to the apartment, there to pick up the box of stuff in Randal's bedroom. The stuff in the luggage we get back to the pawn shop to make a bit of money there. After a quick phone before charging we learn our next destination. We go by metro to Matt's apartment. After arrive at Matt's House, we notice that there will not be so easy to enter the building. The door is occupied by Murray, the policeman with whom we already allowed to make acquaintance. We talk once with the hot dog vendor until we have a little friendly with him. He asks to go to the pawn shop, where to exchange his empty gas bottle. For the job, he gives us the bottle and its receipt. We do so on Mel, the owner of the credit - which is unfortunately busy with his "customers". In our inventory we combine it by first bolt from Murray's office with the mother of the broken radio. Then we put the modified bolt into the hole of the large cuckoo clock on the shelf waiting for a new owner. With a handle, we draw on the clock and make the dubious customers aware that it is time to go. Now we can talk undisturbed with Mel a word and tell him our problem. He assumes the exchange and we take the new gas bottle on the shelf to the left. Back at Matt's apartment, we give full gas bottle to the hot dog vendor who can now pursue his employment again. In gratitude, we still get a hot sausage. Murray also sets out the booth to approve a hot dog. We show him Matt's wallet and enter the building. However, there awaits us no good, because it seems that Matt has his life to an end. The police questioned us and we read the farewell letter that Matt has written before the stove has let grilling. Then we are driven by Murray home and put us there after a long day in bed. We wake up the next morning and catch us first daily newspaper of the day on which we discover a picture of our best friend Matt. In the hallway again Marconi waiting for us and will tell us that today is Monday, although actually was Monday yesterday. Now that we have the owner forced to pay the rent, we leave the building and get a call from Sgt. Kramer, who ordered us to Matt's apartment. The fact that he has interrogated us yesterday, he does not remember. Before we open ourselves to the subway station, we talk to the bum in the alley, call us to be. On the map of the station then we choose Matt's apartment and go there. Once in Matt's apartment, we immediately go into the living room and there you may listen to a lecture by Susan. Apparently something did, to which we could no longer remember. 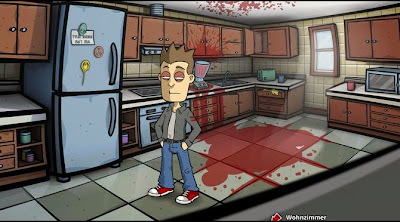 We walk into the kitchen and found there a horrible scene: Matt is fragmented on the ground. The death-tool this time was not of the oven, but the mixer. We suspected again from Sergeant Kramer and know the same, why after we read the suicide note on the refrigerator. We leave the apartment confused and think about how it will go. Front of the apartment Randal note confused that he probably always experienced the same day. Everything he does, but remains, such as the fact that he has Matt's ring sold for a lot of money to Mel. So we should first find the ring and so perhaps enlighten the whole mess again. Once in the pawnshop we learn from Mel, however, that he has already sold the ring. To whom, he does not want to tell, but if we could just take a look at the notebook on the desk, we would figure it out ourselves. We take the empty bottle standing on the gas bottle on the shelf and leave the store. The tube that runs right next to the entrance, we find a rotten lemon, we take the same course. Since we have been technically speaking, not fired, now we equip our workplace a visit. But Phil, the boss is now mad at Randal, because this has probably been drunk on Sunday a donkey in the work. The camera should have recorded. After the interview, we fill the empty bottle at the water cooler and then go back to Matt's apartment. In the kitchen we first take the box of matches. Also located at the top cabinet rat poison we immediately add to our inventory. Also located in Matt's coffee cup under-wall strong alcohol. We combine it with the permanent marker and make this so again writable. We leave the house and head to Clayton's Cave, where the engagement ceremony has taken place. In Clayton's Cave we first talk with Father Roy and learn that he wants a cocktail. So we go to the bartender Elaine and order in his desire-cocktail. But that's not enough, we talk again with Elaine and ask for non-alcoholic cocktails as they would like us to pour any alcohol during the week. After looking at the map we just order a drink at a time. At the end makes it a bill of 380 dollars, we pay reluctantly. The bowl with the corn remains on the table, we pack into your inventory and then go to Father Roy and hand him his order. But apparently he is not particularly thrilled with the mixture. So we help a little and enrich the cocktail with the putrid lemon, rusty razor blade, rat poison and a battery that we discover when we take a look at the remote control in the inventory. We grab the white billiard ball and then go upstairs to the bathroom. Back again we enter again the toilet and see there that we have organized quite a mess. We go to Elaine and she wears on us to put out the garbage. In the alley we combine the garbage with the containers and entertain us with the bum who has previously lived in the alley at our apartment. Back in the bar we enter again the toilets, which are now clean, and take Elaine's make-up stuff on the shelf to us. 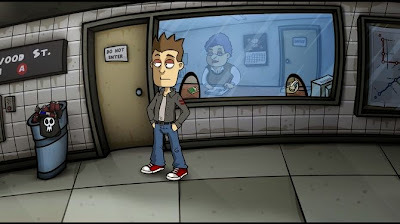 Then we leave the bar and go to Randal's apartment. Once in the apartment we enter the staircase and take the stairs to the roof. There we see in the back of a beer bong lie that we would like to take the same, but a group of hungry pigeons blocking our way. So let's take them with a deft hand movement some of the maize grains that are in our inventory. The mob pounces on it and devours the small grains - but to quench the hunger they have apparently not enough. So we go again with the subway to Mel’s pawnshop and ignite there with matches in the inventory on the gas bottle is already known to a flame. What follows then, can not think of any at home - we roast our maize until we have a bowl full of Popcorn. Back on the roof of Randal's apartment we throw the pigeon-circle a little popcorn out, but even that seems not enough. So we resort to drastic measures and combine the popcorn with a little rat poison and bring the flying animals their last meal. Funnel and hose we can now take.